While five-star ratings and low prices may be the first things you look for when shopping for a new paddle board, you shouldn’t stop there. Reading reviews from other customers is a great way to get more information before you buy. Here are the top 4 things you should look out for from customer reviews so that you can make the most informed decision before you purchase a stand-up paddle board. One of the main factors when choosing a paddle board has nothing to do with the board’s performance on the water, but everything to do with how you get the board to the water. The weight and size of your paddle board will greatly determine how easy it is to lift, carry, and move on land. When buying a board you’ll need to think about how you’ll get it to the ocean, lake, or wherever you want to ride. If you’ve got a roof rack, loading and unloading your board onto your car can be a monumental task. Think about if and how a short person will be able to lift a 10-foot board over their head and onto their car. For those with trailers, keep in mind that the length and width of your board will need to fit into the racks on your trailer as well as hang off the back of your car. Some paddle boards can be almost 3 feet wide and over 10 feet long, these beasts can be a challenge for a single person to carry 100 yards to the water. Inflatable boards reduce size and weight, but still require that you’re able to inflate your board. Keep these factors in mind while reading other customer reviews and see how easily they are able to transport the board you may want to buy. Whether you’re looking to surf waves, race on lakes, or calmly balance and do yoga on your paddle board, you’ll need to match your board to your desired purpose. When reading customer reviews, keep in mind that they may have a different goal or purpose for their paddle board than you. If someone is interested in racing, they’re likely to get thin and long boards for tracking speed. If you’re interested in paddle board yoga, these thin and narrow boards will not be best for you. Try to read a variety of reviews as many paddle boards are able to fit many different styles of riding. 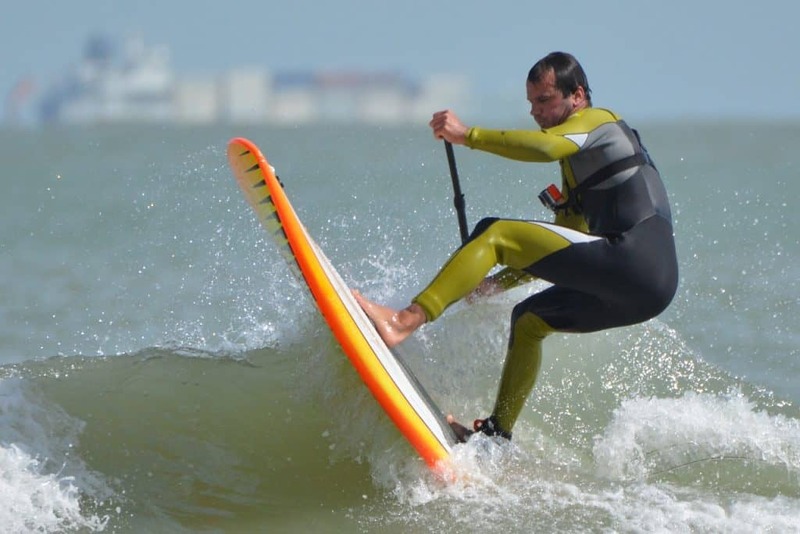 A racer who also likes to surf, may give you great insight into a board that is able to do both. Customer reviews are great at giving you perspective on how your next paddle board will feel as well as fit into your home. Storage is a big factor and even though you can find the sizes specs before you buy, you may not realize how large a board really is. Learning from the experiences of others can be great and give you insights into if certain boards are hard to get up stairs, through halls or doorways, and even give you a glimpse as to how the boards look when mounted on a wall. All of these bits of info can help you decide if a specific board will fit into your home or storage space before you pull the trigger and buy it. When reading reviews be careful of the perfect and terrible reviews that have been made the day of purchase. These immediate reviews are often exaggerated and made based on emotions. Look for reviewers that have used their boards for a few months or a few years. These reviewers will have tested their boards for extended periods of time and should have a better feel and understanding of the pros and cons of the equipment. If you see that a board has great reviews from new owners, but terrible reviews from those who’ve had the board for over a year, you may want to reconsider the purchase. Then again, newer designs and manufacturers may have slightly different models of each board and each production line may have variations. Reading reviews will give you more information so you’ll know what to expect after a year or two of ownership. Whether you’re a seasoned paddle board rider or a first timer trying to decide between hundreds of different boards, reading other customer reviews (especially on our site) will give you an edge and help you make the best decision with your money.